More than 3,000 Blaine County residents struggle to put food on the table. In a community sometimes touted for its wealth, the plight of the local poor often goes unnoticed. However, there are Blaine County advocacy groups dedicated to making life a little easier for people who are having trouble make ends meet. The Empty Bowl project, hosted locally by Boulder Mountain Clayworks and the Blaine County Hunger Coalition, combines philanthropy with artistic fun in their annual bowl-making benefit. Boulder Mountain Clayworks is a studio that provides art opportunities for residents. It is holding the fourth annual Throwing Bowl-a-thon, a clay bowl-making event, on Saturday, Oct. 11, to benefit the Blaine County Hunger Coalition. It takes place at the organization’s Ketchum studio from 10 a.m. to 2 p.m. 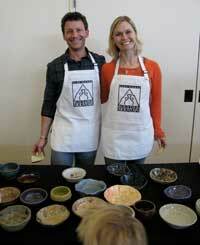 The event is free, and all bowls made will be sold for $20 each at the Empty Bowl Lunch benefit in January. While the Saturday event is a coordinated effort to put a dent in the number of bowls needed for the January event, studio manager Lauren Street said people can come anytime between now and the end of December to make bowls for the Empty Bowl dinner. It’s a pretty free-form process, and that’s probably due to the sheer number of bowls needed in January. Participants are able to make either handmade or “thrown” bowls (on the wheel). If they’d like to come back to glaze their creations, that’s OK too. Otherwise, the studio team will decorate the fired product, Street said. Last year, the 300-plus bowls garnered almost $6,000 in revenues for the Blaine County Hunger Coalition, the most Clayworks has ever made from the benefit. It would like to aim for another record year, Street said. The Empty Bowl project occurs all over the world, Street said, and throughout different nonprofit channels. The bowl making is followed by a benefit dinner. This year, participants are invited to come to the Jan. 18, 2015, event, select a bowl to purchase for $20 and fill it with food from local businesses. After selecting a favorite bowl, guests stand in line for soup, salad, entrees and desserts—anything that can be served out of a bowl. If you want more than one dish, you’re welcome to rinse out your bowl and go back for more, Street said. Local restaurants and caterers donate dishes for the dinner and some even attend the event and serve. Last year, participants were fed by CK’s Real Food, Ketchum Grill, il Naso Restaurant and Wine Bar, Vintage Restaurant, Cornerstone Bar and Grill, Sun Valley Co., Bigwood Bread and more. For $20, people get some world-class food, Street said. Clayworks partners with the Hunger Coalition to put the dinner on and 100 percent of proceeds go toward feeding local families. Street said Clayworks will provide all necessary equipment for bowl making, so you just have to show up. If you want to participate but can’t attend the Saturday event, schedule a party or come alone to make a bowl for the benefit. For more information, call 726-4484.